Since manufacturing of manual drilling & tapping macine in 1964, Chen Fwa Industrial Co., Ltd. develops auto-saving drilling machine (air-hydraulic tool feed) through continuous reserch & improvement. These latest items can simplify work, reduce production cost, and make quality unique & efficiency high. The AD-80VP(P) has step feeding cycle: Spindle will operate like feeding pattern of removing further. Cycle: Rapid approach --> Tool feed --> Rapid return. The cycle can adjust the flow control valve to set the speed of tool feed. Adjust feed & stroke simply, operate easily. All machines are available for Multi-Spindle Head that will increase efficiency in 5-10 times. It can be settled at any direction and position to reduce production cost and make quality unique. 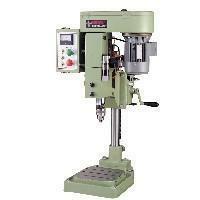 Assemble with Auto Tapping machines for special working of drilling, boring and tapping at one time. Air-Hydro -->Hydraulic equipment adjusted easily. 4 spindle speeds are suitable for deep working of small holes. High accuracy, less vibration & noise. Small size & light weight, suitable for assembly of special purpose machine.